More than 20 states and a number of municipalities will be increasing their minimum wage between Dec. 31, 2018, and Jan. 1, 2019. This includes recent statewide increases in Arkansas and Missouri, as voters in both states turned out in record numbers on November 6th to vote for increasing the minimum wage. The federal minimum wage, which remains the standard in 21 states, has remained at $7.25 an hour since 2009. Not all states on this list will have a large increase in their minimum wage this year, with the exception of employees in Massachusetts, Maine, and at large companies in California who will be noticing the largest hike, with an increase of $1.00 an hour. In Alaska, for example, minimum wage employees will only see a 5-cent-an-hour increase in their wage. Here are the 20 states who will be updating their wage rates in 2019. Alaska statutes require the state to adjust its minimum wage annually for inflation using the Consumer Price Index (CPI). As mentioned, they will only being see a 5-cent-an-hour increase to Alaska’s minimum wage in 2019. Arizona has a planned an increase in minimum wage, effective Jan. 1, 2019. This came as a result of Proposition 206, a November 2016 ballot that went into effect July 1, 2017. The state minimum wage will increase from $10.50 to $1, while the tipped minimum wage will increase from $7.50 to $8. Arizona’s minimum wage will reach $12 by 2020. Effective January 1, 2019, Arkansas minimum wage will be increased from $8.50 to $9.25. This is will a projected goal of $11.00 by 2021. With a goal of reaching $15 by 2022, California’s employees will be seeing some substantial changes in their paychecks. Effective Jan. 1, 2019, the minimum wage for California employers with 25 or less employees increases from $10.50 to $11.00. Employers with 26 or more employees will see the California minimum wage increase from $11 to $12. Effective January 1, 2019, Colorado’s low-income workers will see a 90-cent boost to their hourly wage. Thanks to the passage of Amendment 70 in 2017, by 2020 Colorado’s minimum wage will be $12.00. As for 2019, Colorado will increase the state minimum wage from $10.20 to $11.10. The tipped minimum wage will increase from $7.18 to $8.08. The minimum wage in Delaware has remained unchanged, at $8.25 an hour, since 2015. However, after Senate Bill 170 was signed into law on July 1, 2018, Delaware’s minimum wage increased to $8.75 an hour in October. It is planned to increase again on Oct. 1, 2019 to $9.25. By 2021, Delaware state minimum wage workers will earn $10.25 per hour. Florida has announced its annual indexed rate, effective Jan. 1, 2019, where Florida’s minimum wage will increase from $8.25 to $8.46, and its tipped minimum wage will increase from $5.23 to $5.44. In an effort to increase the state minimum wage to $15 by 2023, Massachusetts passed legislation to make this possible. On Jan. 1, 2019, the Massachusetts state minimum wage will increase from $11 to $12. The tipped minimum wage will increase from $3.75 to $4.35. Maine has a planned rate increase effective on New Year’s Day. The Maine state minimum wage increases from $10 to $11, and the tipped minimum wage will increase from $5 to $5.50. On January 1, 2019, Michigan’s minimum wage will be raised from $9.25 to $10.00, with a goal of raising to $12.00 by 2022. Large and small employers in Minnesota will pay a higher minimum wage in 2019. 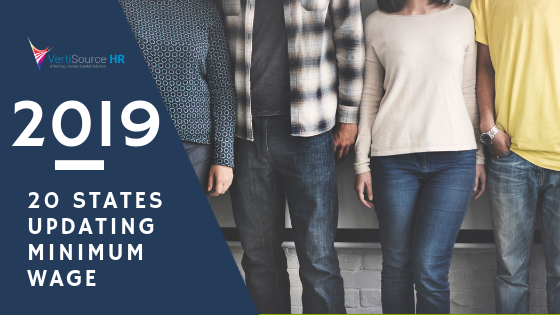 As of Jan. 1, 2019, Minnesota’s large employers– one with more than $500,000 in gross receipts – rate will increase from $9.65 to $9.86. The minimum wage for Minnesota’s small employers will increase from $7.87 to $8.04. There will be no separate rate for tipped employees. As mentioned, voters from Missouri passed the Missouri Proposition B, the $12 Minimum Wage Initiative, which increased Missouri’s minimum wage of 2019 to $8.60. Tipped employees must be paid half of the state minimum wage rate or $3.93 per hour. Before this Initiative, employers in the state engaged in retail or service businesses with an annual gross income less than $500,000 were not required to pay the state minimum wage rate. With the bill passed, Missouri will be expecting some welcomed changes. The Montana Labor Department announced Montana’s state minimum wage will increase from $8.30 to $8.50 on Jan. 1, 2019. Montana prohibits tip credits, so tipped employees must be paid the full minimum wage. In Ohio, employers who gross less than $314,000 will not be covered by the law. But the Ohio Department of Commerce announced that the Ohio minimum wage will increase for non-tipped employees from $8.30 to $8.55, and for tipped employees, from $4.15 to $4.30, by January 1, 2019. Rhode Island’s change will be pretty straightforward. The Rhode Island minimum wage will increase Jan. 1, 2019, from $10.10 to $10.50, and the tipped minimum wage remains $3.89. The South Dakota State Labor Department announced that the South Dakota minimum wage for 2019 will increase from $8.85 to $9.10. The minimum wage for tipped employees will increase from $4.43 to $4.55. Vermont will begin annual indexed increases to its minimum wage in 2019. On Jan. 1, 2019, the Vermont minimum wage will increase from $10.50 to $10.78. The minimum wage for tipped employees will increase from $5.25 to $5.39. Because of a ballot measure from 2016, Washington’s minimum wage will be $13.50 by 2020. As of Jan. 1, 2019, the state minimum wage will increase from $11.50 to $12. There is no separate wage for tipped employees at this time. Contact VertiSource HR® for assistance with your payroll and HR concerns. Contact us at info@vertisourcehr.com or visit vertisourcehr.com to learn more about our full-service capabilities.